Why, despite years of trying, have efforts to achieve lasting, effective school reform fallen short? What curricular and policy elements must be in place to move forward? How should the roles of teachers and education leaders be defined to best support the point of school? A set of tactics linked to strategy, including a planning process that uses “backward design” to accomplish the key work of reform. 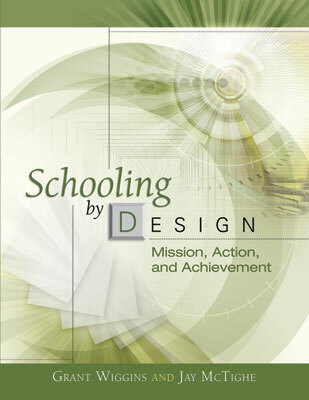 Practical, insightful and provocative, Schooling by Design elaborates on each of these elements and presents educators with both the rationale and the methodology for closing the gap between what we say we want from school and what school actually delivers—for turning vision into reality. GRANT WIGGINS (1950–2015) was president of Authentic Education in Hopewell, New Jersey. He earned his EdD from Harvard University and his BA from St. John’s College in Annapolis. Wiggins, along with his colleagues, consulted with schools, districts, and state and national education departments on a variety of reform matters. He and his colleagues also organized conferences and workshops and developed print and web resources on key school reform issues. JAY MCTIGHE has a wealth of experience developed during a rich and varied career in education. He served as director of the Maryland Assessment Consortium, a state collaboration of school districts working together to develop and share formative performance assessments. Prior to this position, McTighe was involved with school improvement projects at Maryland State Department of Education.